How do I buy The Tutoring Center Franchise? The Tutoring Center is an after-school learning center franchise. The Tutoring Center developed well-honed methods that engage young learning minds and pave the way for academic success. To buy a Tutoring Center requires an investment between $75,000-$100,000. Tutoring Center assists owners every step of the way, including site selection, lease negotiation, layout and design. Their comprehensive training teaches owners everything they need to know to operate a center. The biggest advantage of becoming one of our franchisees is the strength of our System. Your Franchise Fee licenses you to use this System. The Tutoring Center’s System is time-tested for decades, proven to achieve substantial results, and easy to learn. The Tutoring Center System separates us from all other learning franchises. Open The Tutoring Center in any of these available states: AK, AL, AR, AZ, CA, CO, CT, DC, DE, FL, GA, IA, ID, IL, IN, KS, KY, LA, MA, MD, ME, MI, MN, MO, MS, MT, NC, ND, NE, NH, NJ, NM, NV, NY, OH, OK, OR, PA, RI, SC, SD, TN, TX, UT, VA, VT, WA, WI, WV, WY. ESTABLISHED SYSTEM - The biggest advantage of becoming one of our franchisees is the strength of our System. Your Franchise Fee licenses you to use this System. The Tutoring Center’s System is time-tested for decades, proven to achieve substantial results, and easy to learn. The Tutoring Center System separates us from all other learning franchises. ONE-TO-ONE INSTRUCTION - You will offer individual instruction at your center. The competition cannot compete with our level of individual attention and quality! The Rotational Approach to Learning - The Tutoring Center uses the only research based, time-tested, and proven System to rapidly increase academic skills and concentration span. Time-Tested Academic Materials -The Tutoring Center uses academic materials that coincide with the Core Curriculum and National Standards, and help children improve 1 year for every 6 months of enrollment! 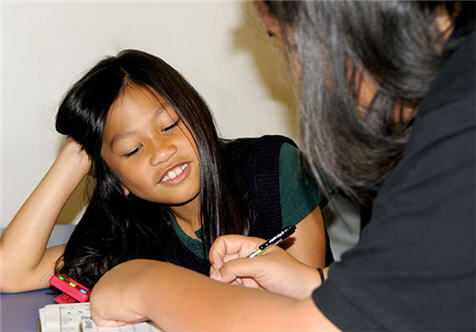 Proven Academic Programs -The Tutoring Center uses proven programs to help children catch up and get ahead in school. Our Geniuses in Training Programs are the best in the industry and we are confident we can help any student. Our programs encourage long term enrollment helping our students stay with us throughout the years. We have the highest student retention in the after-school learning industry. The Tutoring Center’s - Geniuses in Training Academic Programs accompanied with the Rotational Approach to Learning and our academic materials rapidly increase Academic Skills while building Concentration Span so that you can become the most trusted name in tutoring in your community. Character Development -The Tutoring Center is the only after-school learning franchise to offer Character Development to Increase life skills that will make students more successful over their lifetime. Online Homework System - The Tutoring Center offers an online homework website so students can get help with their homework around the clock. This excellent system also offers you an alternate stream of revenue so that you can let your entrepreneurial spirit shine in the global online marketplace! As one of our franchisees, you can recruit students from all over the world. No Paperwork - No Late Nights or Weekends working on paperwork, everything is done at the Center during working hours. Your Head Instructor completes all the necessary paperwork so that there is no need for you to take paperwork home with you. The Tutoring Center has been awarded the top 50 Franchisee Satisfaction Awards from 2010-2013. The Tutoring Center’s ideal candidate seeks a balance between work and time with family and friends. We look for individuals who possess traits of Integrity, Quality, Enthusiasm, Service, and Teamwork because we know these traits are what it takes to be successful! The Tutoring Center’s ideal Franchisee is a person who is passionate to help children succeed, possess an entrepreneurial spirit, and the necessary drive to do well in this industry. Change the lives of Children in your Community: Being a part of our elite Franchise Team means that you will make a difference in the lives of the children in your community. You will be appreciated for making a significant difference for the children in your neighborhood. What could be more gratifying than that! No professional sales, business, or teaching experience required. Integrity - Do you feel you can make a strong commitment to protect The Tutoring Center’s Brand and operate your Center as part of an approved System? Quality - Do you feel you can make sure your Center is in the best physical condition possible; that if you observe anything that needs to be fixed or repaired, you do so as soon as possible. Do you feel you can require your staff to use “The Rotational Approach to Learning” at all times, and for all students? Teamwork - Do you feel you can work as a team with The Tutoring Center Franchise Corp and other franchisees to help us all become a better company? Now more than ever, families look to The Tutoring Center as the #1 choice for tutoring in their local communities. Join the franchise that's enriching the lives of children in communities across the world and start enjoying the benefits our franchisees experience every day. REQUEST INFORMATION TODAY TO LEARN MORE! The Tutoring Center uses a proven referral based marketing plan “The Tutoring Center’s Enrollment Pyramid” that is the “Best in the Industry”! No High Pressure Sales here so you will have no problem getting students enrolled at your center. Referral Based Marketing -The Tutoring Center is the only after school learning franchise to be able to effectively implement a referral based marketing strategy that allows you to save advertising dollars while still attracting and retaining students. No Sales Pitch! - You do not need any Sales Experience! In fact we know that 80 % of the families that walk into your center will enroll. No Sales or Marketing Experience Necessary - The Tutoring Center will provide you with time tested ways to enroll students so you will never have to guess how to attract business from the families in your community. The Tutoring Center offers unlimited Training Opportunities; giving you easy access to the information you need to run a successful franchise. Train With The President - Train Directly with The Tutoring Center’s President and founder, Dr.Thalheimer, You get complete understanding of the business model he developed for your success. Comprehensive Training Program - You will complete a Comprehensive Training Program so when you open your doors, you will already have all the knowledge you need to run a successful franchise. Annual Refresher course - (Free) Most of the competition charges (you) for additional training. The Tutoring Center genuinely wants franchisees to succeed so we offer additional training free of cost. Local and Online Marketing Seminars - Marketing Seminars that will be accessible in your local area or online allowing you to stay up to date with our current System and Best Practices. Franchise Mentor Program - The Mentor Program allows you to shadow a successful franchisee (before you open), as well as ask them questions so you can get advice from the most experienced franchisees in the business who are extremely excited to help you succeed. Franchise Support - Our Franchise Support Team will work with you step by step, from the moment you sign your Franchise Agreement. You can be confident you will receive the support you need to run a successful business. Grand Opening Assistance - The support team will guide you through a series of ten time tested checklists covering every aspect of opening your center to save you massive amounts of time and money. This includes finding a great location, Designing and building out your center, Training you and your staff, and Giving you a time tested and proven pre-opening marketing plan to help you break even in the quickest possible time. Mentor Program - You will be assigned to a top performing Mentor Franchisee for your first six months to a year. For no charge you will receive ongoing advice and support from an accomplished and successful franchisee. You will have access to the experience and insight of someone on the front lines of our business who has been open for some time and proven themselves extremely successful. Best Practices - Our Support team is constantly developing and refining our Best Practices to make sure we stay at the cutting edge of the industry! You never have to worry about falling behind the competition. Customer Service Training - Each week our Support Team will provide you with a weekly staff meeting agenda to keep your staff on track and up to date with our current System and Best Practices so that you can rest easy knowing your staff will be prepared to handle any situation at your center. Individualized Franchisee Websites - The Tutoring Center will provide you with your own individualized and search engine optimized website that will allow you to stay connected with your families through social media and blogging and easily be found online so your online presence will be just as strong as your physical location. Our websites are considered the highest quality in the industry. It is hard to believe that it is almost a year ago that my husband Tim and I attended Franchise Training as new franchisees, and now, I am returning to attend Franchise training as a mentor. What an exciting journey it has been. As I reflect back over the last year, I take pride and joy in what I have accomplished. I am also very thankful and appreciative of the tremendous support I have received from Dr. Thalheimer, Franchise Support, my Franchise Mentor, and the fabulous easy to follow System. Without this support, I would not be enjoying the tremendous difference The Tutoring Center, Flower Mound, Texas is making for so many children and their parents in our community. I applaud Dr. Thalheimer for creating a complete comprehensive process to contribute to the success of his Franchisees. It is like being part of a family who gives us the support we need to make it on our own, and it has allowed me to make a dream of mine come true. I now get to spend my time making a positive difference in the lives of children. Just the other day I had a parent tell me: “We had tried everything to help our daughter to read. We had her tested for dyslexia, and when the results came back negative, we just did not know what to do. Then, we enrolled her at The Tutoring Center. We just received her report card, and she went from C’s to A’s in reading, and best of all, her confidence is up, she’s happy, and she loves going to The Tutoring Center.” The difference we make for families is my dream come true! Thank you Dr. Thalheimer and The Tutoring Center! After 24 years of corporate experience I was ready to start a business of my own and I evaluated several franchisees last year. As parents and educators , education is our passion and after school tutoring was on top of our list. We had a strict criteria for selecting a business and only The Tutoring Center made the cut because of its programs, systems, and financial business model. The Math, Reading, Writing, Study Skills, Enrichment, and SAT/ACT test preparation programs offer much needed tutoring services for students in kindergarten to High School. The systematic checklist process for opening the center was well done and we did not have any problem working through the checklist to open our center. The support staff responded to our questions on time and the training prepared us well for the opening. We didn’t have to invent anything, everything related to programs and systems was in place and every element of the TTC system is focused on delivering quality programs and best service to the parents and children. I especially love the enrollment process because it is very structured and it provides all the tools necessary to understand the child, engage the parent, answer all the parent’s questions, outline the customer service policies, and best of all make the life of a Center Director much easier. We recently opened our center at Johns Creek, GA and we continue to get excellent support from the support team and our assigned mentor. The mentor program has helped me tremendously as it has expedited my learning curve and I am able to implement best practices much faster to achieve my financial goals. On top of all this the whole family is benefiting as my daughter has enrolled in the math program, my nephew is enrolled in the writing program, and my son is an intern tutor at the center. The Tutoring Center is not currently active in our directory, but here are some other recommended selections for you to explore.